The Custom Builders Council provides a forum for custom builders for education on cutting-edge information, services, & products. As a leader in the building industry, the Southern Arizona Home Builders Association (SAHBA) has implemented a Custom Home Builders Certification Program. This certification program was created by the demands of homebuilders and homebuyers to set professional standards. The goal of this program is to further strengthen the building industry within the community and increase consumer confidence. As a Certified Custom Builder, program participants must adhere to quality standards outlined in a Professional Standards Directory. These standards cover requirements from basements and foundations to windows and glass. This program also aspires to increase the technical and professional capacities of local builders. Not only are Certified Custom Builders recognized by the industry for their professionalism and integrity, they are also recognized by the home-buying public as experienced, knowledgeable builders who can be counted on for quality workmanship and materials. Adhere to quality standards outlined in NAHB’s Professional Standards Directory. Comply with the SAHBA Code of Ethics. No unanswered or unexplained complaints on file with the Registrar of Contractors. 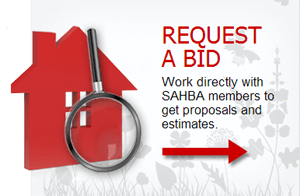 An annual review by the SAHBA Certification Review Committee is required. TRS Custom Home Builders Inc.
As a leader in the building industry, the Southern Arizona Home Builders Association (SAHBA) has implemented a Custom Home Builders Certification Program. This certification program was created from the demands of homebuilders and homebuyers to set professional standards. The goal of this program is to further strengthen the building industry within the community and increase consumer confidence.